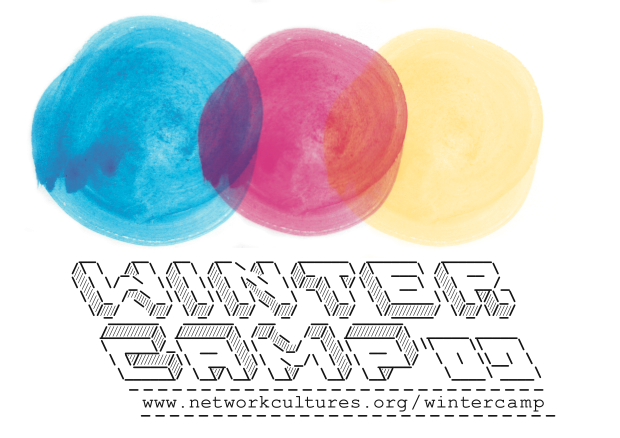 This week it was the week of Winter Camp, an event organized by the Institute of Network Cultures (INC). The event is bringing different networks together which have been around for at least two years, to see what happens when they settle down, when they are not so new anymore. Often the activity level drops after the newness has gone and the question posed on Winter Camp is how networks deal with this, if they should transform in to so-called ‘organized networks’ or stay true to their distributed nature. Do professionalizing the network and the introduction of hierarchies, rules and regulations decrease their spontaneity or can a balance be found between structure and autonomy. Bringing these twelve groups together helps to see all different ways these networks deal with the subject matter and at the same time provide a space for those networks to meet face-to-face, often essential for the existence of those networks. Some networks actually never met in real life or only sparsely meet at convergences. The networks present on Winter Camp where: Blender, MyCreativity, dyne.org, GOTO10, Bricolabs, Edu-factory, FLOSS Manuals, CreativeLabor, FreeDimensional, Genderchangers, Microvolunteerism and Upgrade! Some of the MoM bloggers where also present at this event as resident blogger to both document the different networks in their individual projects during the week, as look at their those questions posed by the INC. To check out our blogs of the event check out the Winter Camp blog.